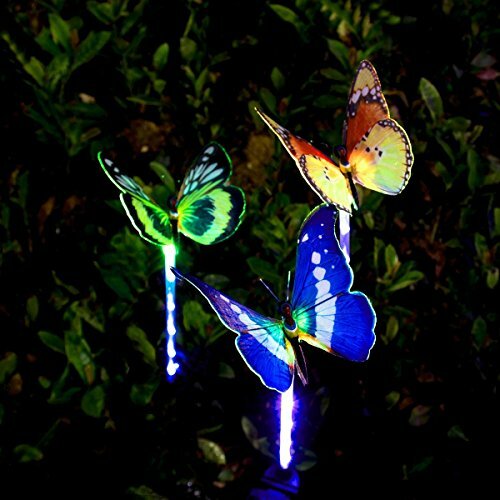 - You get three solar powered stake lights, each one with an upper section that's a beautifully artificial fiber optic butterfly. - Each of solar path lights is lit with a RGB LED so that it appears to glow from within. Their IP65 rating means that they're weatherproof and will stand up to rain and snow with no problem. - You just press the sturdy lower part of the stake into the ground wherever you want one of these gorgeous decorative lights. - They're solar powered, so there's no wiring and no batteries to replace. - You can move the led garden lights to a different location whenever the fancy strikes you, keeping your garden decorations fresh and varied. With their 2V, 120 mAh solar panels and 600 mAh batteries, these yard lights will provide six to eight hours of light after only four to five hours of daytime charging in the sun. - The backyard solar lights turn on automatically when it's dark and turn off in daylight. - There's also an on/off switch if you should want to turn off the solar porch light at night for any reason. Order today and start enjoying and showing off these wonderful lights in your yard, garden, or patio! This YUNLIGHTS solar lamp is sold with a one-year, full money-back guarantee. PERFECT SOLAR YARD DECORATION - 30 inch tall, 3 pack RGB color changing solar powered fiber optic butterfly garden stake lights, with 5 purple LEDs in each transparent stake which has fabulous light effect. SOLAR POWERED & EFFICIENT LIGHTING - Built-in solar panel automatically recharges during the day, these solar powered garden lights charge up with as little as 4 to 5 hours of sun, and then provide 6 to 8 hours of light. EASIEST POSSIBLE INSTALLATION - Just press into the ground wherever you want a beautiful illuminated decoration. No wiring or batteries to replace; uses free solar power. You can use these solar lamp in almost any outdoor space. LIGHT SENSORED & AUTO ON OFF - The solar led lights light up automatically when it's dark and turn off in daylight(Turn on the switch at first use). There's also an on/off switch if you should want to turn off the outside solar lights at night for any reason. RELIABLE 1-YEAR MONEY-BACK GUARANTEE - IP65 waterproof class, ideal as solar yard lights, solar patio lights, solar driveway lights, solar walkway lights, solar exterior lights. Their colorful glow can outline a path, front walk, or driveway. If you're unsatisfied with this item for any reason, we'll immediately refund your purchase price.